Stormtroopers. Born to destroy the Rebels. Born to follow orders. Like any good soldier, Stormtroopers are always ready to take on their next mission. Not everyone loves the Rebels. They are rebels for a reason, you know. While everyone was always so concerned about how Luke and Leia were doing, who was thinking about the poor Stormtroopers who were being taken out en masse throughout the rebellion? No one. No one cared. But we cared. Even though they were told to destroy the Rebel Alliance, they were just upholding orders handed down to them. Their lives were just as important as anyone else’s, but that all got forgotten about simply because they were on the Dark Side.But that’s ok - if you’re a Stormtrooper then a few trips to the galactic shrink should help iron out all of those feelings of neglect. Do you just hate Rebel scum? Maybe it's time you put on this Plus Size Stormtrooper costume and wreak some havoc on the supposed good guys. This officially licensed Star Wars costume will have you well on your way to upsetting the Rebel forces this Halloween. The plus size costume comes with a jumpsuit that has Velcro closures in the back for easy on and off. The jumpsuit features EVA molded foam armor pieces on the front only, including the chest, legs, arms, and codpiece. A molded foam belt is also included. 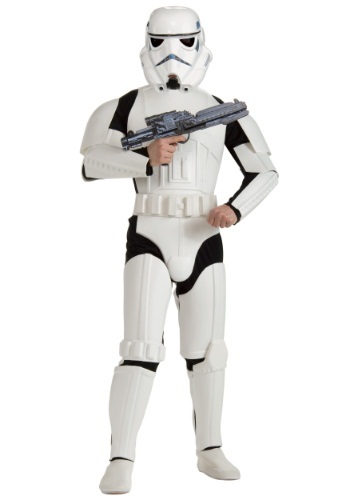 Complete the look with the two-piece plastic Stormtrooper helmet. Add a pair of white boots and a blaster to take this look into a whole new galaxy this Halloween! Apparently, 2XL sizes are for Wookiee-height folks only. My son loved it. Fit great. Shipping was fast. Not a bad costume for the money. The white polyfoam sewn to the costume is creased in many areas due to the way it was put in the package. All in all it looks good. Won't be bad at a party which is usually dark. This costume quality is not the best, but looks great. The mask is cheap. The boot covers on the bottom of the legs are hideous.